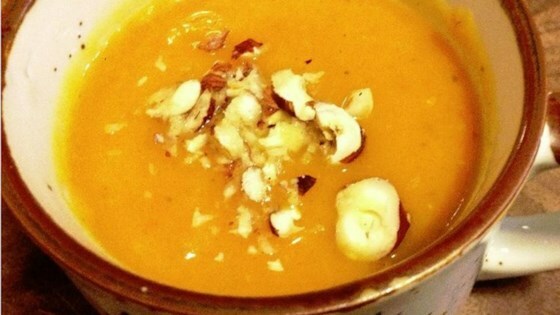 "Super healthy delicious soup for the winter. You can add coconut milk for more richness." Heat coconut oil and butter together in a large pot or Dutch oven over medium heat; cook and stir onion and garlic in the hot oil-butter mixture until slightly softened, 1 to 2 minutes. Season with salt and black pepper. Stir squash, sweet potatoes, and apple into the onion mixture and cook until heated through, about 5 minutes. Pour in chicken broth and bring to a boil; add basil, curry powder, and bay leaf. Reduce heat and simmer until sweet potatoes and apple are softened, 15 to 20 minutes. Remove from heat and season with salt and pepper. Puree soup in the pot with a hand blender until smooth. See how to make a comforting, warming winter meal. What a great mix of flavors. Substantial enough for a meal. I replaced the bay leaves with tarragon, turned out great. Absolutely perfect recipe. Subbed olive oil for coconut oil. Sub pears for sweet potato, limited grocery store. It was amazing!